The ongoing and all-encompassing crisis in Zimbabwe, the ailing Southern African state presided over by Robert Mugabe, a former schoolteacher turned liberation patriarch, is easily visualised, writes Sean O’Toole. Imagine an unending queue of noughts, a retinue of zeros that wrap line after line. Money that is cheaper than wallpaper. On a visit to the country in 2003, when the currency was still denominated in hundreds and thousands, not billions and trillions as it is now, I watched supermarket cashiers dump overflow wads of cash into buckets beneath the counter. In a country characterised by fatal need, Zimbabwe was, as it still is plagued by a surplus of useless cash. Last year Zimbabwe, which gained independence in 1980, Mugabe its first – and to date only – president, had an inflation rate of 231 million per cent. The relentless march of the noughts has shown few signs of abating in 2009. In January, the country’s newly launched 50 billion dollar note bought its bearer two loaves of bread; by March the price of this daily necessity had jumped to 7.5 trillion Zimbabwe dollars. 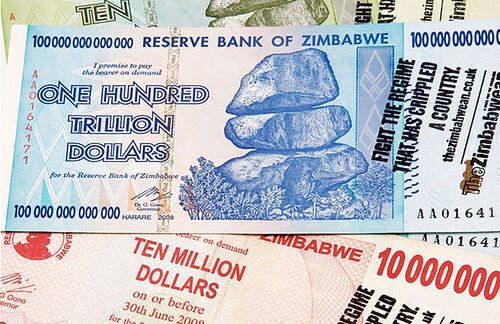 At present one Zimbabwe dollar is roughly equal 0.00000002 British pounds, or 0.00000003 US dollars. Nothing really. Which is all very necessary context when it comes to understanding South African advertising agency TBWAHuntLascaris’ recent award-winning Trillion Dollars Campaign for the Zimbabwean, an exiled London-based daily that offers alternative news coverage of the crisis in that country. Founded, edited and published by Wilf Mbanga, the print edition of the Zimbabwean is currently subject to a punitive 55 per cent luxury import duty, putting it beyond the reach of ordinary Zimbabweans living in Mugabe’s truth-averse autocracy. In an attempt to raise the profile of the Zimbabwean amongst exiled Zimbabweans living in South Africa, a constituency said to number two million people, creatives at TBWAHuntLascaris, an agency well known for its sardonic pro bono campaigns, devised an agit-prop billboard and poster campaign that uses Zimbabwe’s diminished currency as both medium and message. 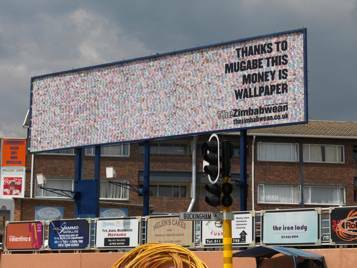 ‘Thanks to Mugabe this money is wallpaper,’ read the bold san-serif type on a prominently sited outdoor billboard featuring Zimbabwe dollars as the print substrate. A similarly executed street poster bluntly offered: ‘Z$250,000,000 cannot buy the paper to print this poster on’. The agency’s studied mix of humanism and humour won TBWAHuntLascaris the Cannes Grand Prix for Outdoor, one of an armful of awards, making it the single most awarded South African campaign at Cannes in the award’s 56 year history. 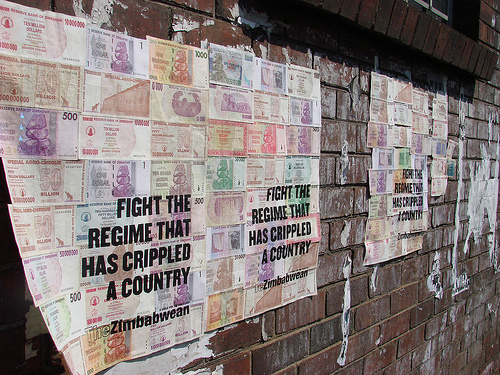 ‘When we conceptualised the campaign the idea of using Zimbabwean dollars came about; we couldn’t think of a stronger or clearer way to illustrate the seriousness of the situation in Zimbabwe,’ said Damon Stapleton, executive creative director for the campaign’s team. ‘Effectively we turned the currency, a symbol of what is happening in the country, into the medium,’ added a delighted Gavin Heron, group Managing Director at the agency. 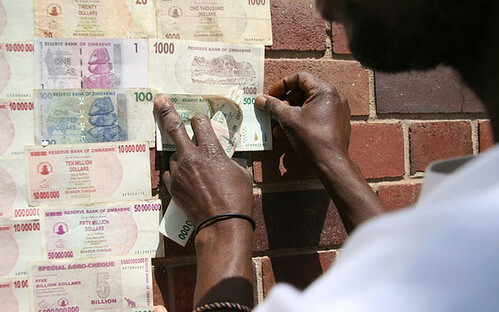 While the idea of repurposing Zimbabwe’s worthless currency is not entirely original, artist Christian Nerf handing out free, personalised Zimbabwe bank notes during an artist residency at the Johannesburg Art Gallery in 2003, the Trillion Dollars Campaign has achieved far greater visibility. ‘We sent bundles of cash to captains of industry, politicians and media personalities,’ the agency told coloribus.com. Bemused smiles and creative kudos in Cannes aside, the campaign has achieved exactly what it set out to do. In the week of the rollout of the campaign the Zimbabwean’s website logged more than two million hits.